It's the time of year for a non-soundtrack LP... Babla Shah isn't out of place on this blog though, being Kalyanji and Anandji's younger brother, having contributed drums and percussion for the composing duo, and having been married to singer Kanchan whose voice featured on a number of their songs. (Babla & Kanchan were additionally a successful musical entity in their own right). 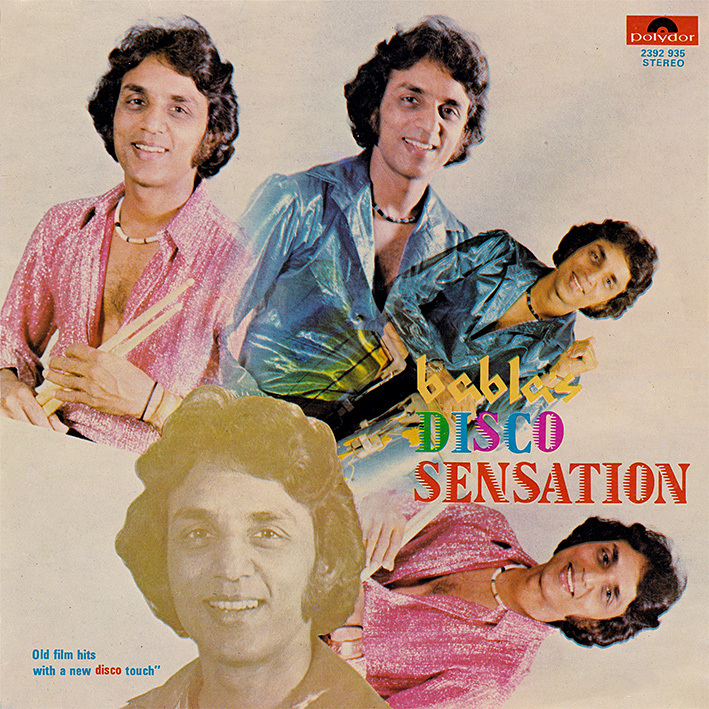 Much like the Charanjit Singh records posted during previous holiday seasons, 'Babla's Disco Sensation' contains instrumental takes on Bollywood film hits. An electronic groove runs through this one. I have on occasion seen it likened to Singh's legendary 'Ten Ragas To A Disco Beat', a comparison it doesn't really live up to but an entertaining set nonetheless. Its best moment is 'Man Dole Mera Tan Dole', an excellent update of a track from 1954's 'Nagin'. A case of keeping it in the family in fact; the original had big brother Kalyanji playing the clavioline, said to be the first use of a synthesizer in an Indian movie. I'm also quite fond of the slow-moving 'Kabhi Hota Nahin' from a film Babla scored himself and featuring Kanchan on wordless vocals. A couple of non-filmi tracks bookend the collection; 'Babla Orchestra Title Music' borrows from Dee D. Jackson's iconic 'Automatic Lover'... I guess one could consider that a good thing? Thanks a lot for this rare share ! Many thanks for your post! I would be excited if you could unearth any other early Indian electronic music. Thanks for yet another amazing upload. I only discovered this blog a few months back but have added a wealth of incredible Bollywood music to my collection. Thank you for all the hard work you put into it, I'm looking forward to more discoveries in the coming year! Horst - I'd love to find more early Indian electronic albums, but I'm unaware of any good ones. Lucertola - glad you found your way here! Thank you so much for this wonderful upload. Kudos to your effort. Thanks for the upload. Kaise Bani is one album where Babla and Kanchan duo performed brilliantly. If you have please share. Stunning. I'm floored by the dramatic horns on the reinterpretation of Aye Mere Dil Kahin Aur Chal. This album will be a welcome break from all the afrobeat, jazz, and soul I've been listening to lately. Wow! This sounds great! Also, I love the ridiculous album cover! Thank you PC!